It’s the dilemma most of us face each day, either when the alarm goes off or later, when the hunger of an impending lunch hour kicks in: we need to eat. And for many bustling through a busy schedule, so begins the search for a meal on-the-go. With the latest food trends centered more around nutrition than ever before, the team of chefs in Chick-fil-A’s kitchen have been busy cooking up more options to give health-seekers choices ‘round the clock for breakfast, lunch and dinner. And while we will always serve the original chicken sandwich, waffle fries and our handspun milkshakes, we’re making it easier than ever to grab a quick, convenient meal that won’t crush your calorie count. In that spirit, we’ve created a list of six health-conscious meals available on the menu every day, and added some insider tips to keep carbs and calories low, even when ordering more indulgent items. 1. 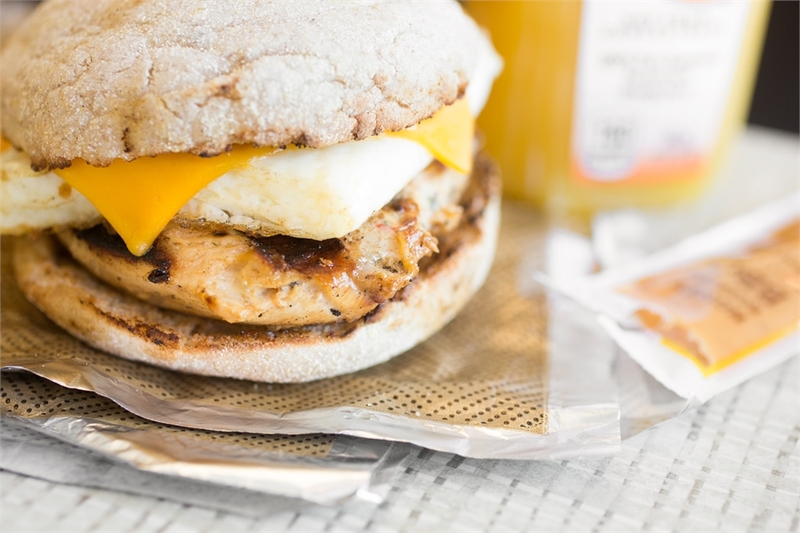 Egg White Grill: The summer of 2016 was a historic time – not only did Chick-fil-A introduce its first sandwich on an English muffin, it also added grilled chicken to the breakfast menu – a move that’s “not as crazy” as it is low-carb, low-calorie and all around delicious. Served with egg whites and American cheese, the sandwich has 25 grams of protein and 300 calories. 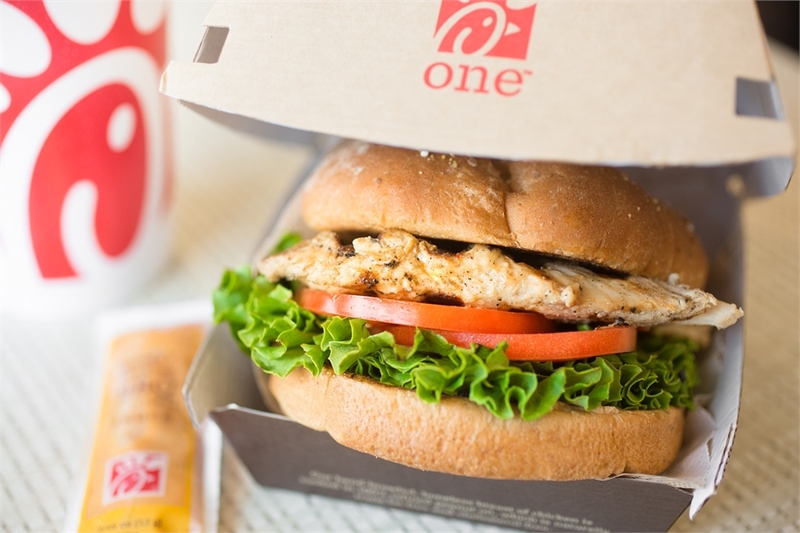 • It’s easy to customize the Egg White Grill (and any menu item, for that matter) on the Chick-fil-A One mobile app. 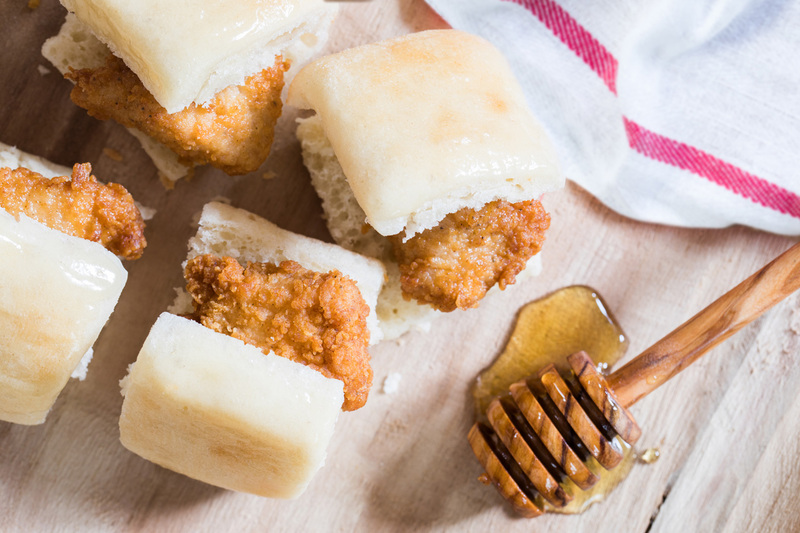 Swap out the English muffin for a biscuit, add Colby Jack, or select the original breaded breakfast fillet, because only you know how you create your favorite Chick-fil-A! • Looking to spice up your breakfast a notch? The Egg White Grill and our Honey Roasted BBQ Sauce make a perfect pair! 2. Chick-fil-A Spicy Southwest Salad: Unlike anything else on the Chick-fil-A Menu, this new salad, packed with high-quality ingredients and fresh produce, includes a spicy kick. “Our customers asked us for healthy options and bold flavors, so we were excited to add the Spicy Southwest Salad to the menu,” said Jon Bridges, chief marketing officer of Chick-fil-A. 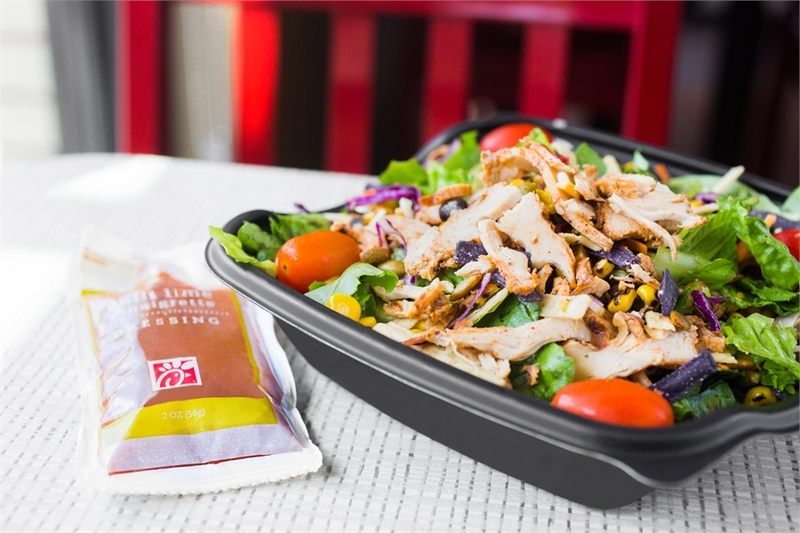 The salad entrée is prepared fresh in Chick-fil-A’s more than 2,000 restaurants each day and topped with spicy grilled chicken, zesty roasted corn, black beans and pepitas (fancy for pumpkin seeds). The salad contains just 260 calories before extra toppings or dressing. • The Spicy Southwest Salad has two dressings designed to pair with it, Order the Chili Lime Vinaigrette for a lower-calorie option or the Creamy Salsa Dressing to indulge. 3. Superfood Side: While we think our Waffle Fries are the best, we know that sometimes everyone needs to mix it up. Chick-fil-A was one of the first in the industry to add two superfoods – kale and Broccolini® -- to the menu by introducing the Superfood Side—a low-calorie side option. 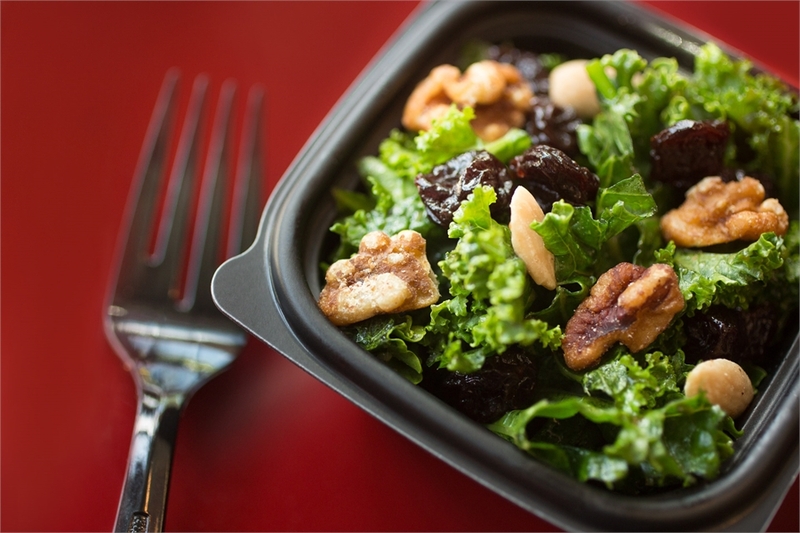 The two leafy greens are tossed in a sweet and tangy maple vinaigrette dressing and topped with flavorful dried sour cherries. Sound like something you’d order in an upscale restaurant? That’s probably because James Beard recognized chef and restauranteur Ford Fry (famous for King + Duke and The Optimist in Atlanta) helped Chick-fil-A develop the recipe! He’s not done – stay tuned for more Fry-inspired dishes coming to the menu. • Order the Superfood Side with the 8-count Grilled Nuggets for a filling meal at 280 calories. On its own, the Superfood Side has 140 calories and 7 grams of fat in the 5 oz. portion and 170 calories and 8 grams of fat in the 8 oz. portion. 4. Grilled Chicken Sandwich: At fewer than 400 calories and five grams of fat, this savory sandwich is a big hit among healthy eaters. A toasted multigrain bun holds a grilled boneless breast of chicken, fresh lettuce and tomato and honey roasted BBQ sauce together in one flavorful package. 5. 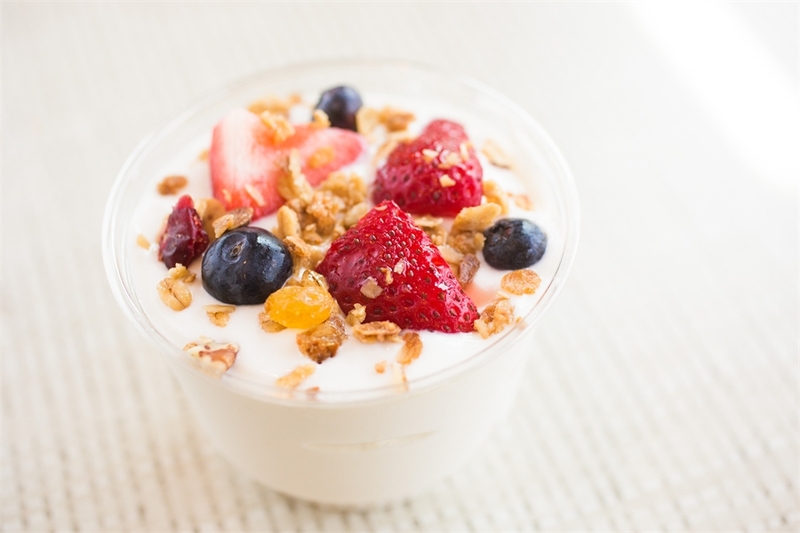 Greek Yogurt Parfait: Chick-fil-A’s yogurt parfait was already one of the healthiest items on the menu, and the switch to Greek yogurt made it even more nutritious. The 110 calorie parfait has half the sugar and twice the protein – seven grams in each serving – of the previous parfait. It is made from all-natural ingredients with no preservatives, artificial colors or flavors, and is served with fresh strawberries and blueberries. • Ask for Chick-fil-A Harvest Nut Granola to add a little crunch, or chocolate cookie crumbles to add a touch of indulgence. 6. Chick-n-Minis: Still craving a classic chicken meal? At 350 calories, the Chick-fil-A Chick-n-Minis make a satisfying lower-calorie alternative to the Chick-fil-A chicken biscuit. Served at breakfast, the bite-sized breaded chicken nuggets are served on soft yeast rolls lightly coated with honey butter spread and has half the fat of the chicken biscuit. • Add a medium THRIVE Farmers coffee for just 5 calories. The only specialty-grade coffee in the industry, the THRIVE coffee served at Chick-fil-A was specially brewed to pair with the Chick-fil-A breakfast menu. • Hold the butter. Ask servers to leave out the butter on any classic Chick-fil-A sandwich to shave a few calories and fat grams off your meal. You can also skip the cheese on salads and wraps. • Light Italian Dressing adds only 25 calories to a wrap or salad and can be substituted for any dressing or sauce. • Sweets lovers don’t have to skip dessert. Chick-fil-A’s newest dessert item, Frosted Lemonade, also comes in a low-calorie version. Its diet lemonade is hand-spun with its signature Icedream ice cream to create a refreshing and original treat that’s fewer than 250 calories.